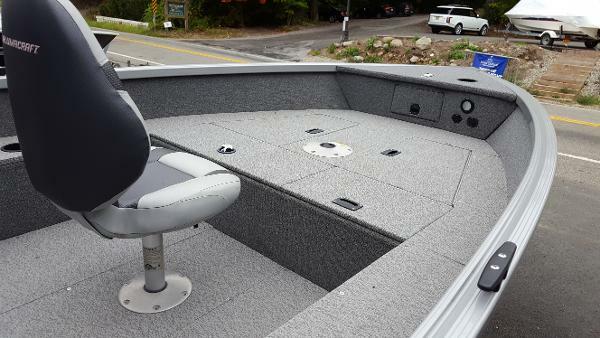 Color (Platinum/ Blueberry), Extended Port Side Bench, interior Blue LED Lighting, Seat Covers, Bimini Top, Fish Finder, Tilt Steering, MP3 and USB Port, Stereo with Blue tooth and 4 speakers, Reclining Captains Seat, Table, Vinyl Flooring, For more information call and ask for Jerry. 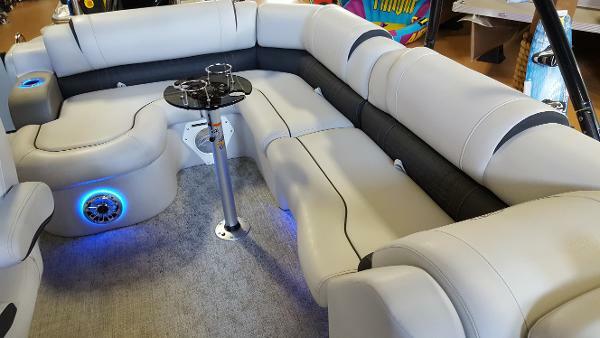 Color (Graphite/ Caribbean Blue & Gray), Interior Blue Lighting, Seat Covers, Bimini Top, Tilt Steering, Fish Finder, MP3/ USB Plug, Stereo with Bluetooth and 4 Speakers, Table, Vinyl Flooring, Reclining Captains Seat, Powered with Minn Kota Electric Motor, For more information call and ask for Jerry. 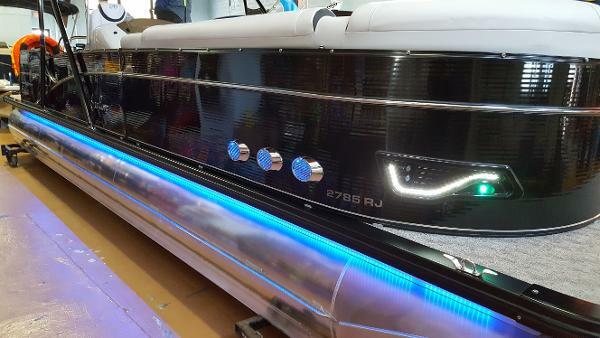 p>Color (Steel / Firecracker) Triple Tube Package, Teak Vinyl Flooring, Front Sleeper Bench, Blue Ice Lighting Package, Seat Covers, For More Information call and ask for Jerry. 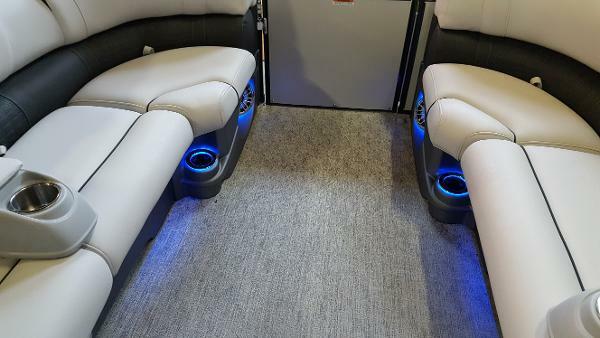 Color (Black/ Mojito & Gray, Triple Tube Package, Full Gray Teak Vinyl Flooring, Bar Package W/ Large Bar, Refreshment Center, 3 Stools, Front Sleeper Bench, Hight Back Reclining Captains Seat, High Back Reclining Passenger Seat, Blue Ice Lighting Package, Swim Up Wet Bar, Seat Covers, For More Information Call And Ask for Jerry. 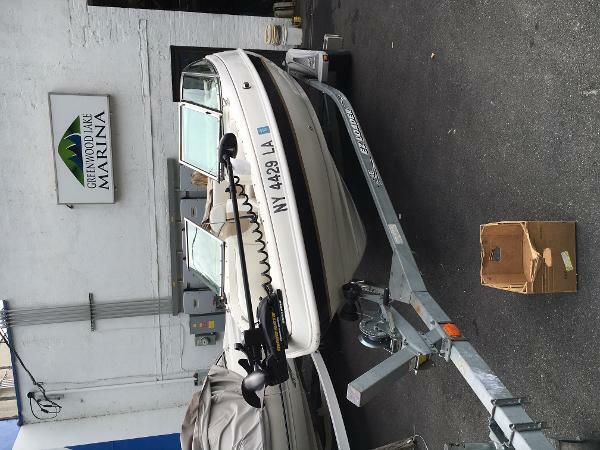 Boat Includes, 26" Pontoons, Performance Lifting Strakes, Aluminum Under-Skin, 46 Gallon Fuel Tank, Ski Locker, Gauge Package, USB Port, Tilt Steering, Windshield, Seat Bolster, Bluetooth Stereo with 4 Speakers, Sea Grass Vinyl Flooring, Ski Tow Bar, Table, Salt Water Package, Tongue & Grove Deck, Bimini Top, Seat Covers, No Trailer, for more information call and ask for Jerry. 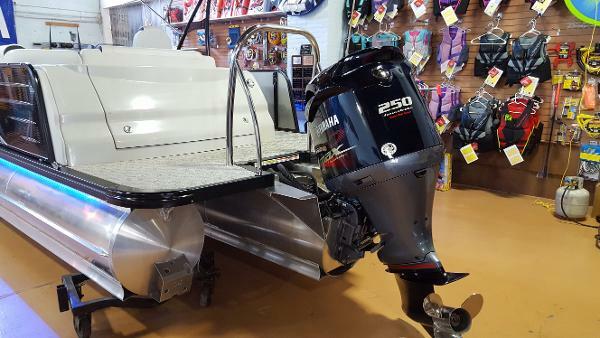 Enjoy Summers on Lake with this 23 foot pontoon with Yamaha F150 Outboard. Blue sidewall with Silver interior. Has Blue Canvas individual seat covers. 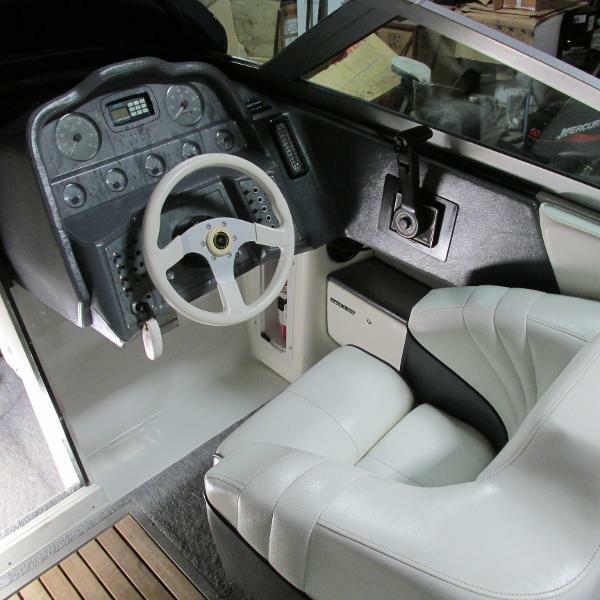 Has a High Back adjustable reclining Admirals chair and a Garmin Striker ACV. Listen to the Infinity PRV315 BT Radio with 6 INF622MB Speakers. Polished Corner caps, lights under rub rail and a rectangular table with base. 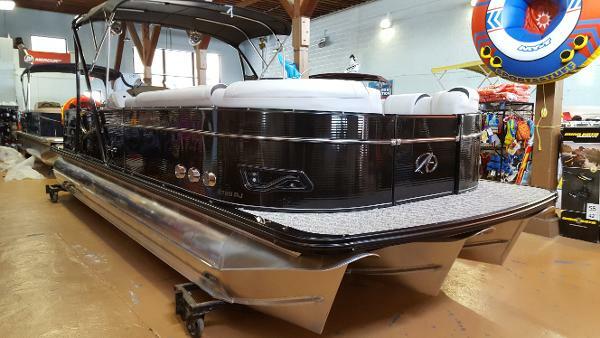 Also has Outboard ski tow bar, privacy station with rail and curtain. Blue Ice Lighting package. 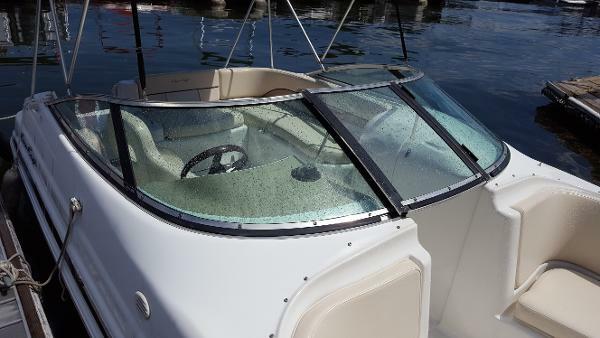 Enjoy this LSZ Elite windshield Boat. Is Caribbean Blue and Black. 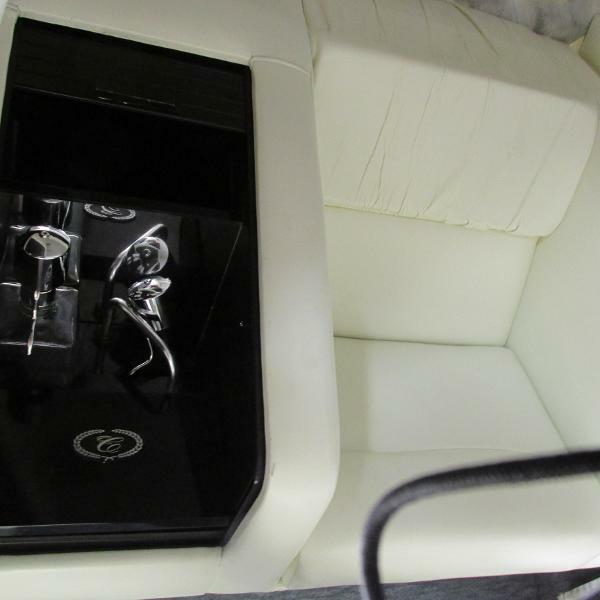 Individual black seat covers with the silver interior package. 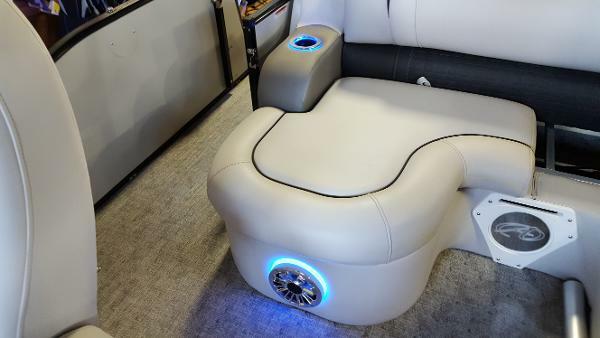 Includes a High Back reclining Admirals chair , Infinity PRV315BT Radio with 6 speakers. 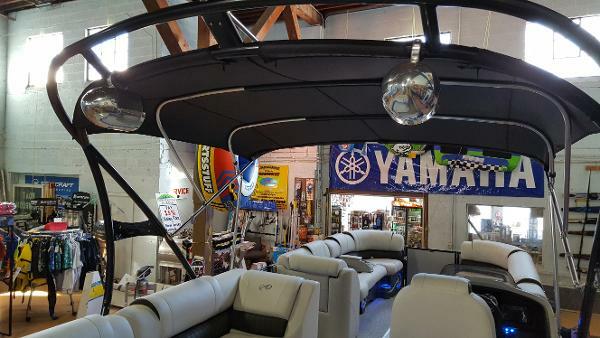 Black soft grip with chrome spokes steering wheel, Greywood Rectangle table with base, Silver Compass Luna flooring , 2 rear entry ladders with Blue Ice lighting package. 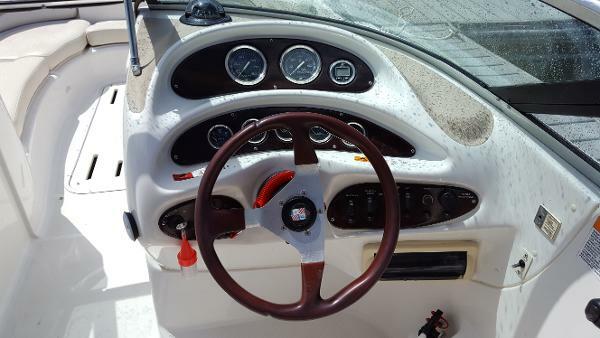 Options Include,Caribbean Blue Walls, Individual Caribbean Blue Seat Covers,Silver compass Luna flooring, 25’ Tubes, Chrome Docklight Assy, Silver Interior Package, , Outboard Ski Tow bar, Trailer not included, for more information call and ask for Jerry. 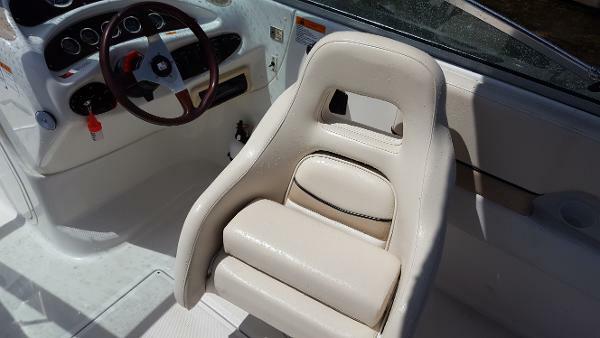 Boat includes Seat Covers, Captains Chair, USB w/ AUX, Tilt Steering, Chrome Dock lights, Buckskin Vinyl, for more information call and ask for Jerry. 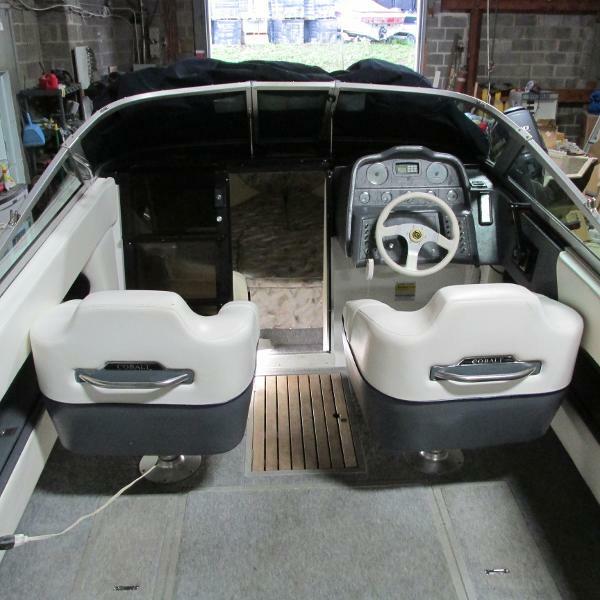 Boat Includes Bimini top, Black canvas Seat covers, High back reclining admiral’s chair, 4 INF622MB Speakers, USB W/ AUX, Black soft grip chrome spokes steering wheel, Silver compass luna flooring, Polished corner caps, Chrome dock light Assy, Mirror chrome logos, , Buckskin vinyl, Portable cup holders, Blue ice lighting package.and 1 locking table base Color (white flake} No trailer, PRICE $41995 Last One, for more information call and ask for Jerry. 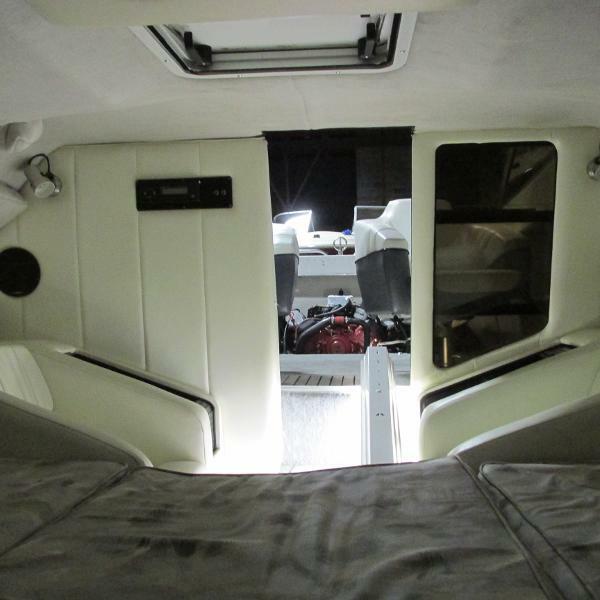 019 Tahoe 700, Options Include, Bow & Cockpit Cover, Depth Finder, Fiber Glass Swim Platform Extension w/4-step ladder, Tilt Steering, Tandem-axle 2-brake upgrade, Premium Stereo upgrade for wakeboard tower, Kicker, LCD Display, 500W amp, subwoofer, 6 Kicker speakers 4 cockpit, 2 on tower $aft-mounted remotes, Folding wakeboard tower $ racks, with Bimini Top, Stainless steel propeller, Spare Tire. Color Black w/Red $ Black Accents, for more information call and ask for Jerry. 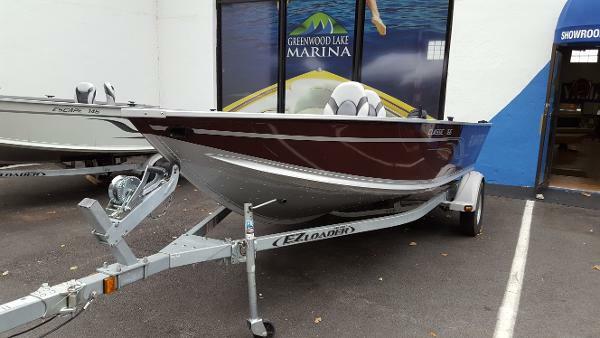 14’ Paddle pontoon boat, boat includes Bimini top, fishing option, stereo with 2 speakers, USB/ AUX plug, 12V plug, Color (Carbon/ Mojito), for more information call and ask for Jerry. 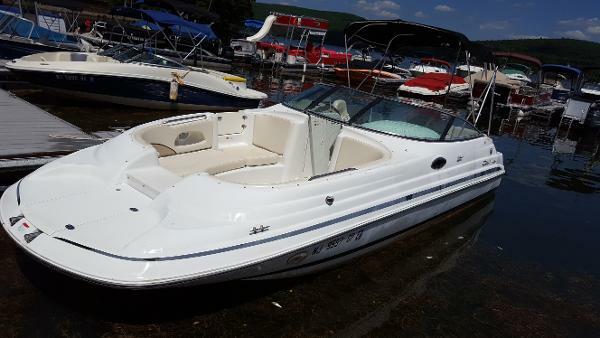 Length 16’4", Beam 82", Max. 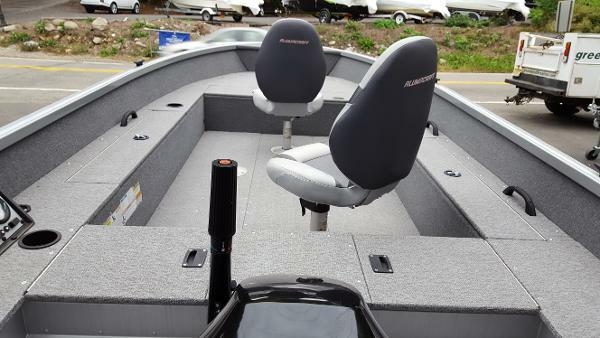 Horsepower 60, Weight 778 lbs., Fuel Capacity 17 gal., Rod Storage up to 7’, Livewell Bow 34 gal., instruments, speed, tach, volt, fuel, horn, 2 deluxe seats. EZ Loader Trailer Included. For more information call and ask for Jerry. 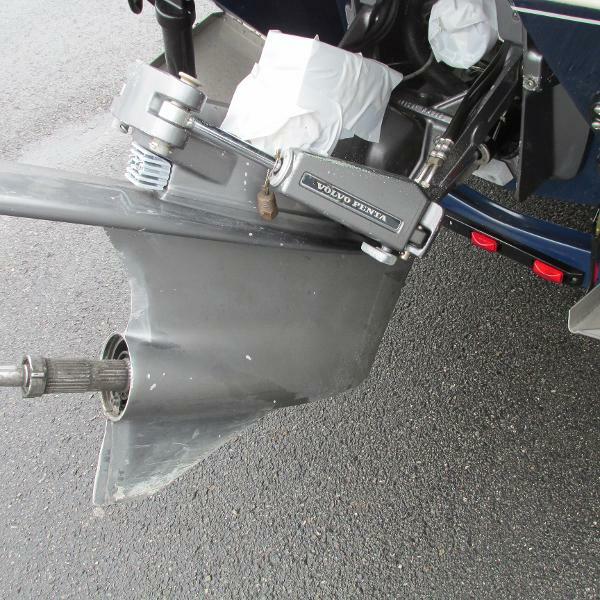 Price is Boat and Trailer Only. 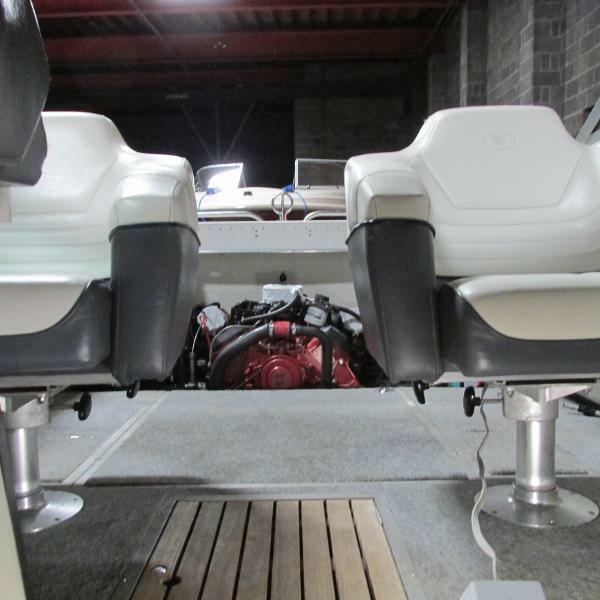 Have some family fun on this 30 foot pontoon. 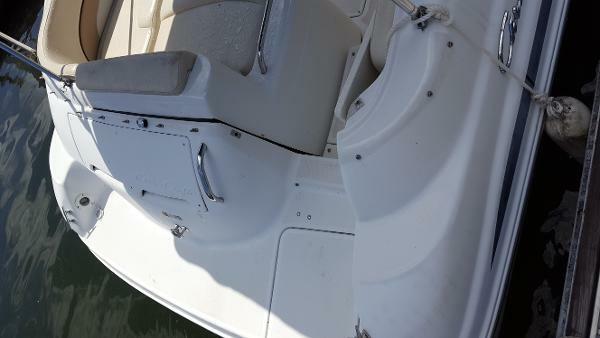 The Ebbtide 200 Bow Rider features bold stripes on the exterior and stainless steel bezeled instruments at the helm. 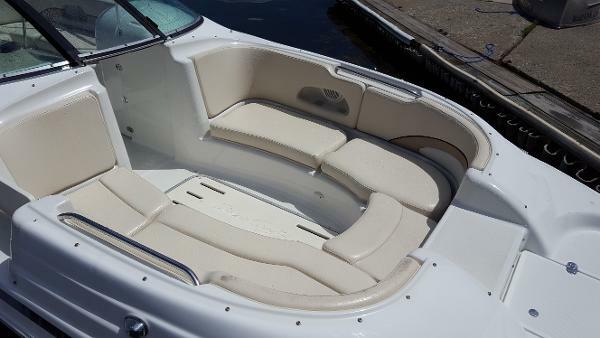 With her versatile sport interior including driver and passenger bucket seats, rear bench and bow seating, and AM/FM stereo with CD player, this boat rides in style. 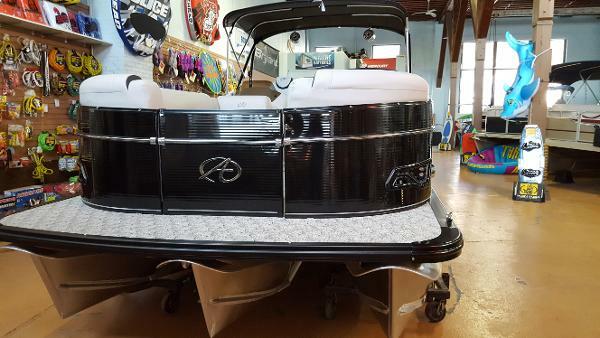 Stop by showroom or Give us a call. 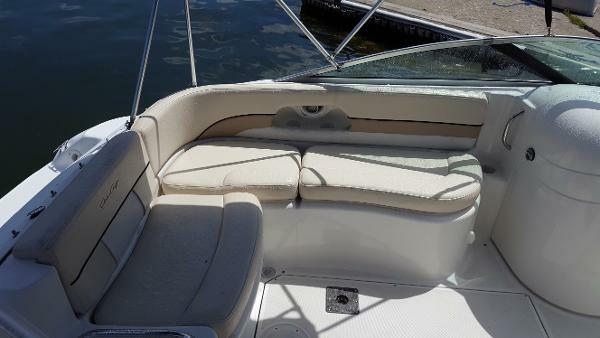 The value-priced Bennington II 207L is built with the same attention to quality and detail as high-end boats. 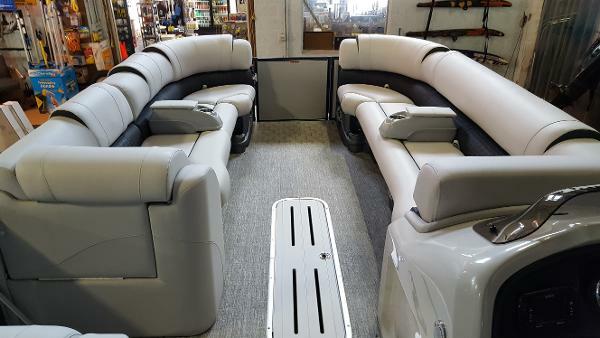 This pontoon boat comes standard with rotocast seat bases, a deluxe helm seat with slider, plush upholstered corner chaise lounges, extended seating areas, deluxe carpet, ABS console with lockable storage, burl dash panel, color-matched gauges and AM/FM cassette stereo. For more information call and ask for Jerry. 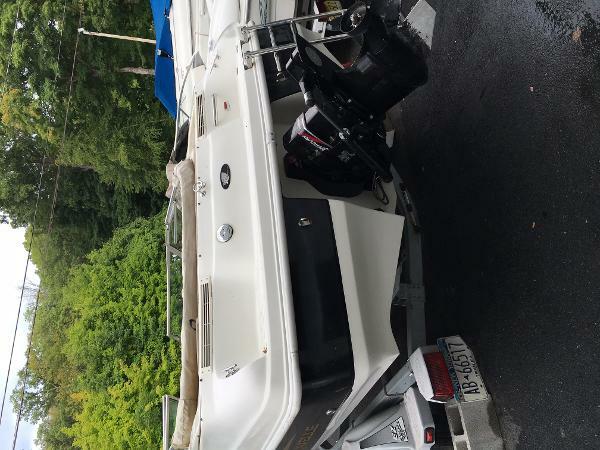 2002 Caravelle 186 fish & ski, Lenght: 18', Beam: 8'0", Net Weight: 2500, powered with a Mercury 3.0L, trailer included, for more information call and ask for Jerry. 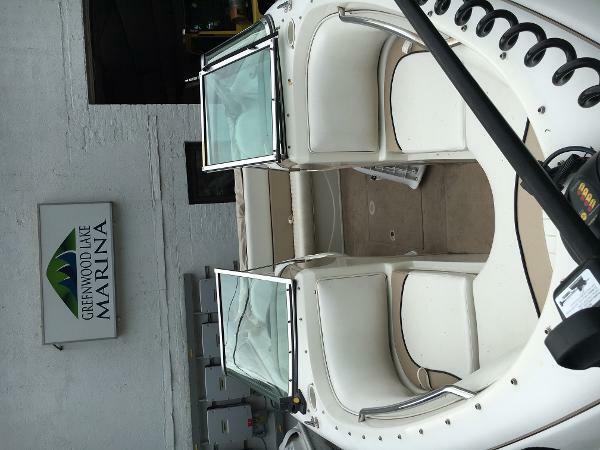 Chris-Craft 232 Sport Deck, powered with a 5.0 220 HP, boat only for more information call and ask for Jerry. 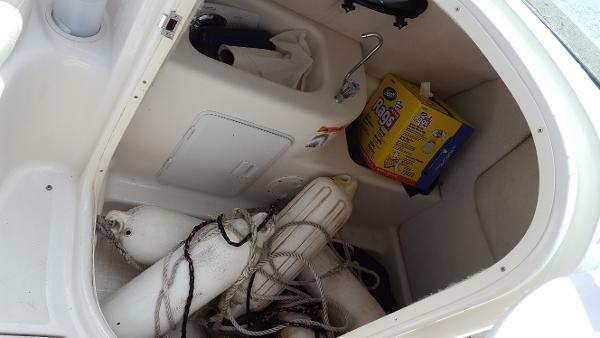 This boat is very clean. 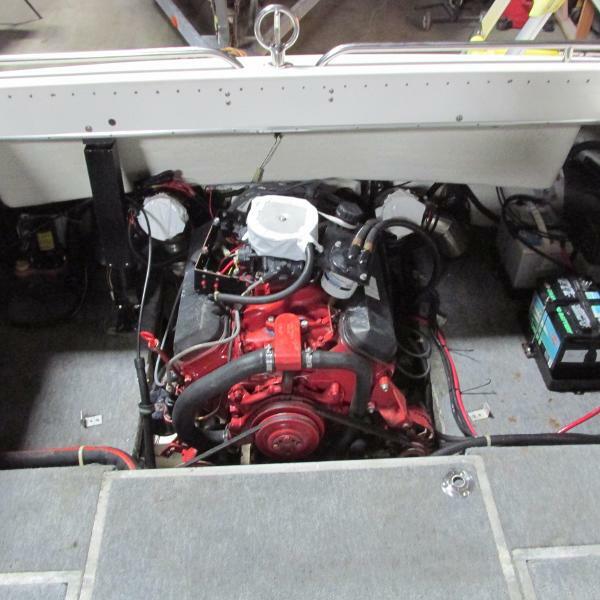 1993 Cobalt 243 Cuddy Cabin, powered with a Brand new Volvo 7.4L With Dual Stainless Steel Props, Captains Choice Thru Hull exhaust system, (NEW MOTOR), Lenght 24’, Beam, 8’0", Net Weight 4100, Custom Matching Tamdem Axle Trailer With Brakes. 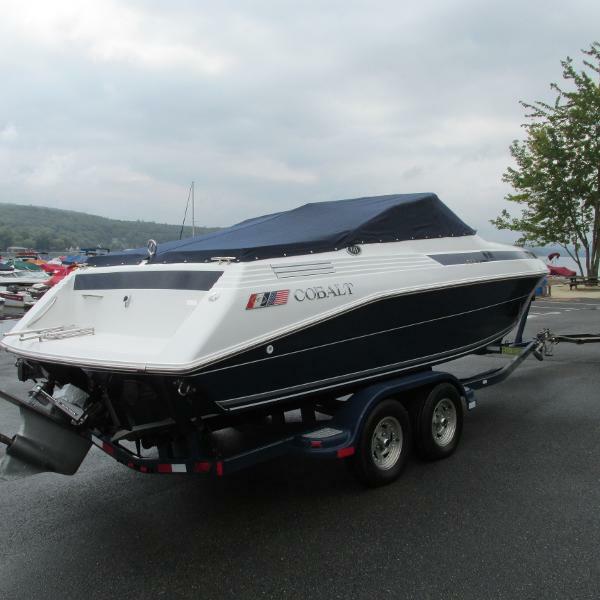 (Color) Boat and Trailer Dark Blue, Mooring Cover also included.